During the last week, I have been considering a new “joint” business venture. And while I won’t disclose the specifics, I will say that I am still on the fence about it. It’s constantly filled my mind since it was presented. Each week I take a trip to Gaylord to visit my friends at the Detroit Coney Island and eat coney dogs. I am originally from the Detroit suburbs and there is nothing better to me than authentic Detroit Style Coneys (there is no substitute). It’s my reward to myself and I get a chance to socialize with friends. On the way to Gaylord, I phoned a friend and he said something very simple, yet so profound. He said, “What will you get out of it and what will the other person get out of it?” Brilliant. Almost instantly, I made up my mind but continued on my journey for coney’s. 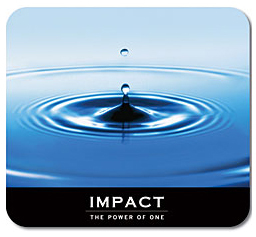 I thought, YES the “Power of One.” I bought the mouse pad but what I got that is far more valuable is a gentle affirmation and now perhaps I will make a better decision. And to think, I almost grabbed my pens at the front of the store and headed out, but I stuck around. It was well worth my time.